As soup season nears, our columnist walks us through making stocks from all the bits and pieces you'd otherwise toss out. While certainly not as devious as the three witches Shakespeare created to stir the pot at the beginning of Macbeth’s fourth act, I am willing to toss almost anything into a bubbling cauldron if it will result in superior soup. Stopping short of eye of newt and toe of frog, wool of bat and tongue of dog, I’ve happily experimented with the growing number of soup-starting products now on the market – that would be farmers market, meat market, fish market and supermarket, I am pleased to report. Seeing oxtails and duck backs on offer on a regular basis both signals a renewed awareness about which ingredients simmer down to really good stock and pushes forward a basic tenet of a greener home kitchen: Use every last bit. Michelin-starred chef Heston Blumenthal, another pretty prolific Brit, acknowledges in his latest book, “Heston Blumenthal at Home,” that making a stock can be as simple as throwing the picked-over carcass of Sunday’s roast chicken (locally sourced, of course) in the pot with some aromatic vegetables, covering all of the ingredients with cold water, and simmering the mixture gently for an hour or two. The broth will have a roasted, reheated flavor. It will be tasty, economical, serviceable, and, not least, sustainable. Taking stock to the next level, though, “is one of the most exciting and worthwhile challenges in the kitchen,” Blumenthal tells home cooks in his book. And it requires judiciously chosen ingredients. Lucky for us, we live in the trendy age of bone broth. 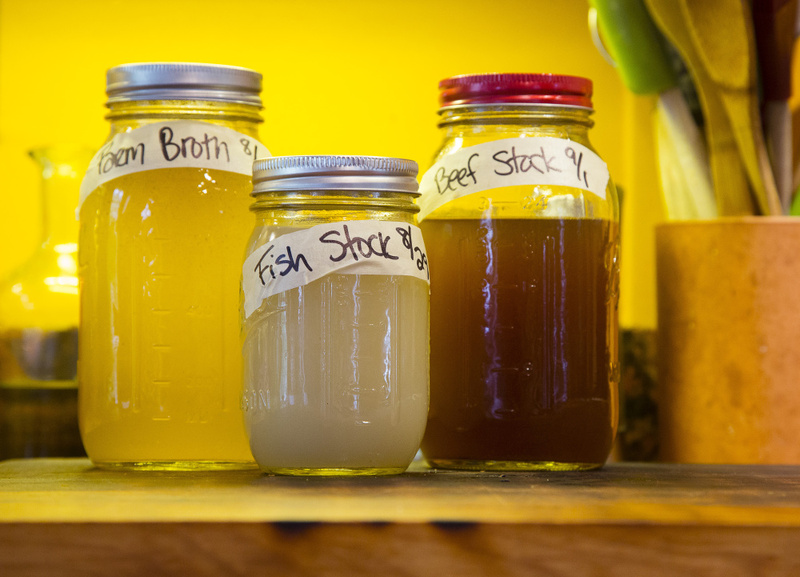 Bone broth is made by simmering bones for many hours in water with a splash of vinegar. Believers say the resulting collagen-rich elixir reduces inflammation while building up the immune system and helps shore up leaky guts while fortifying brittle (human) bones. Detractors say it boils down to plain old soup stock that carries a ridiculously fat price tag. 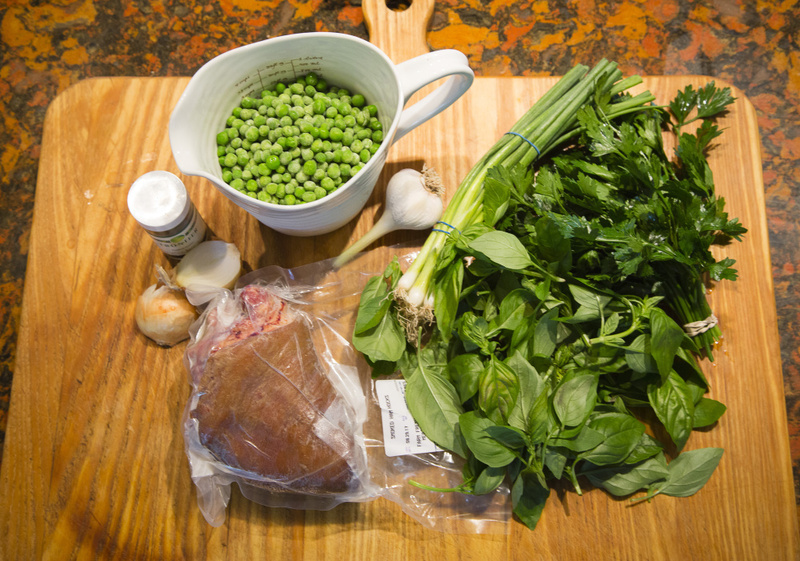 Ingredients for ham hock pea and herb soup. Regardless of where you come down on this particular debate, the bone broth movement has made sourcing the choice components Blumenthal espouses a much easier prospect, says butcher Kaitlyn Weikel, who spends her days breaking down local, whole animals at The Farm Stand in South Portland. There you’ll find pigs’ feet and smoked ham hocks in the fresh meat case and frozen beef knuckles, marrow bones, chicken backs and lamb necks in the freezer case. The only stock option she’s not seen coming across her cutting board in great supply is chicken feet, which are available from a variety of small-scale organic poultry farmers for between $2 and $4 per pound. They’re also available in Asian groceries in Portland. If you don’t see a bone you want at your local butcher shop, just ask, or better yet, call ahead; most are willing to source them for you. Weikel is quick to mention that local fishmongers have a ready supply of fish heads and lobster bodies that are ideal for stock. And she points to the growing group of Maine mushroom growers who can be tapped for dried caps and tough fresh stems that simmer down to some serious vegetarian umami-filled stocks. And finally, she calls out vegetable seconds bins (The Farm Stand has one, and several have popped up in larger grocery stores, too) as the perfect place to find ugly, inexpensive vegetables that will work just fine in stock. I, too, in the past, have touched on techniques for making meatless stocks from spent corn cobs,parmesan rinds and pea pods. Back in my kitchen, I always put Sunday’s (or Monday’s or Wednesday’s, as the case may be) chicken carcass in a stockpot. To add depth, I also throw in a raw chicken back or two that I’ve either cut from the whole chicken myself when I butterfly it to reduce roasting time or bought from a chicken farmer who had them bagged separately from cut-up chicken parts at the processor to avoid waste. When you are making a stock that includes any or all raw bones, skimming the foam that rises to the stop with a metal spoon results in a clearer broth. 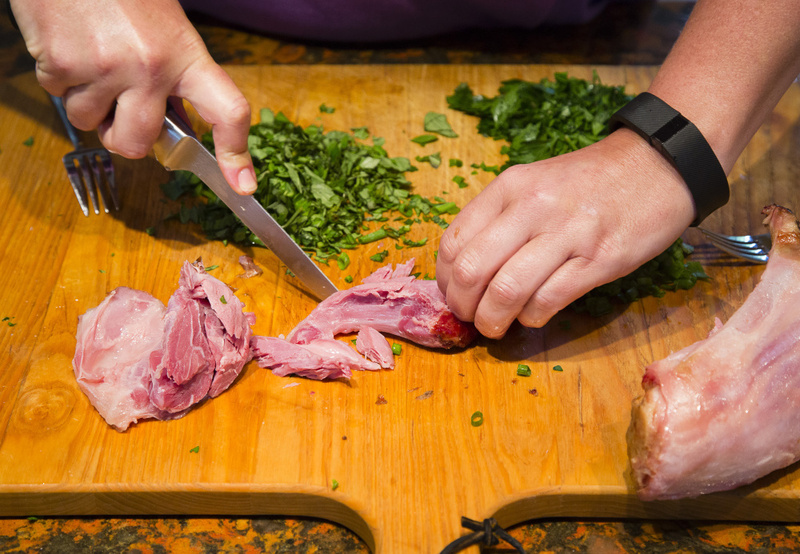 The columnist cuts meat from a ham hock to use in soup. If I’ve found beef or lamb bones to use in stock, I employ a 5:1 ratio of raw bones to mirepoix, a mix of two parts onion to one part each celery and carrot. For every five pounds of bones in the pot, I pour in one gallon of cold water. Vegetable and fish stocks only need to simmer slowly for 45 minutes to an hour. And when I say slowly, I mean at a rate of 5 to 10 bubbles breaking the surface per minute. Rapid bubbling equals cloudy stock, and you don’t want that. Chicken stock should simmer slowly for 3-4 hours and beef and lamb for 6-8 hours. To pull out the deepest flavors possible from the beef and lamb bones, I start by searing them in a hot oven (450 degrees F) for about 30 minutes. This extra step gives the meat still clinging to the bones more color and deeper flavor, and provides an opportunity to deglaze the pan with liquid to pull up all the stuck-on, yummy bits and add them into the stockpot for even more flavor. Seeing as I am making references to all my favorite famous British writers, I’ll cop to cribbing the idea for this recipe from another one, Nigel Slater. 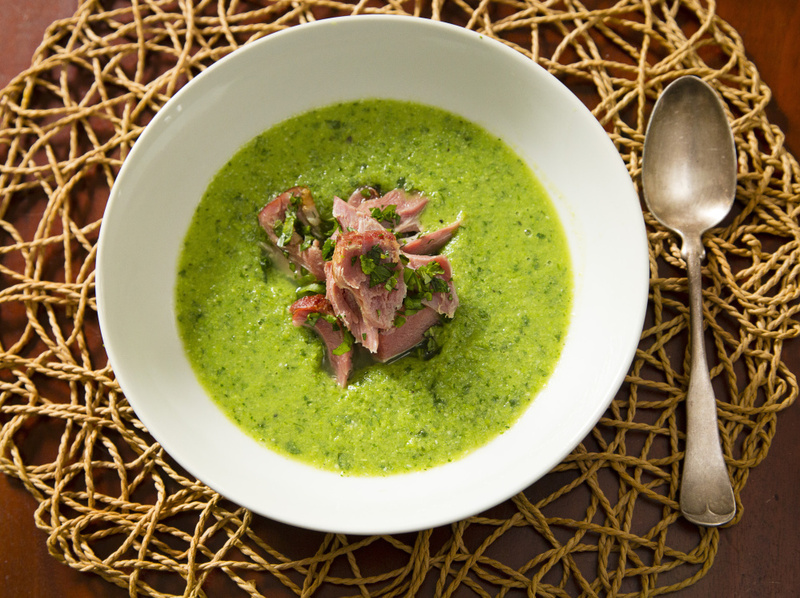 In his book, “Eat: The Little Book of Fast Food,” he outlines a simple recipe for whizzing a quick, smoky ham hock stock with frozen peas and fresh herbs for a thick, tasty soup that will help warm you up on cool Maine autumnal evenings. Place hocks in a deep pot with just enough cold water to cover. Pierce each onion half with 1 clove and add the halves into the pot. Bring to a simmer, skim off the foam that rises to the top with a metal spoon. Cover and simmer until the meat is heated through and tender, 45-50 minutes. Remove the hocks from the cooking liquid and set aside to cool. Lift the onion halves out, too. Remove the clove from each and return them to the pot. Add the peas and garlic cloves to the pot. Cook until peas are tender but still bright green, 3-4 minutes. Combine the herbs in a bowl. Add 2/3 to the pot. Cook for 1 minute longer. Use a blender to puree the soup. Add black pepper to taste. Tear the ham from the cooled hock in large pieces. Toss the ham pieces with the remaining herbs. Spoon the soup into 4 warm bowls. Divide the herby ham among the bowls and serve hot.